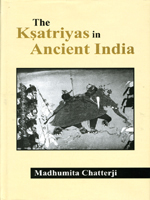 462 pages, 5¾ x 9"
The Ksatriyas in Ancient India examines the history of the Indian caste system through the origin, life, and legasy of the Ksatriya. The role of the Ksatriyas as the ruling class, their relationship with other castes, their socio-economic and political activities are all detailed, bringing their history to life. Special attention is paid to Ksatriya rise to power, charismatic leadership within the caste, the position of women, social and economic relations, and the decline of power associated with this enigmatic caste.